You shouldn't have to wait 2 years for straight teeth. With Six Month Smiles, you won't. 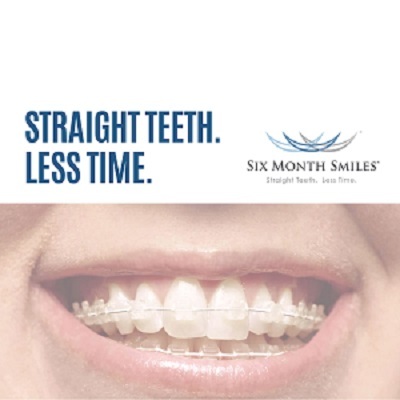 The Six Month Smiles system is for adults with crooked, spaced, or misaligned teeth. The average time is only 6 months! Six Month Smiles is the best choice for adults interested in making quick, affordable, and life-changing cosmetic improvements to their smiles with adult clear braces. See and hear from real people just like you. such as clear aligners. It's about time. It's about options. What about Aligners and Metal Braces? guidance of a trained dentist), and can take more than 6 months. Traditional ortho (metal braces), is another route, but that usually takes about 2 years and can be more expensive and invasive. 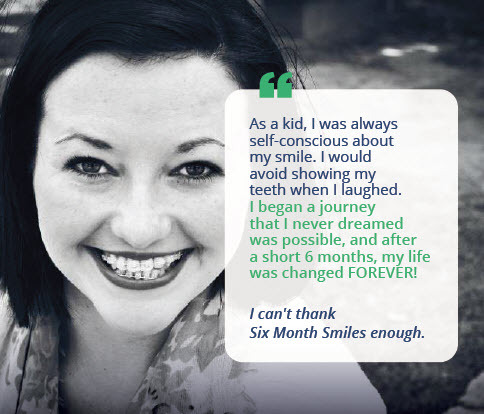 Contact us today to see if Six Month Smiles is right for you! Chances are if you are reading this, your smile is not something you are proud of. We’ve helped thousands of people smile with confidence and it might be the perfect solution for you!